*Pets are welcome with prior approval. 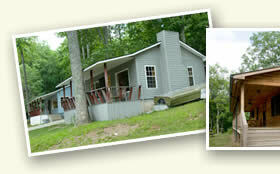 Please note pet fees for the Lodge ($100 for up to 2 pets) and the Fisherman’s Cabins ($50 for up to 2 pets). No pets allowed in Rippling Brook. Damages: Guests are responsible for payment of damages made to either the cabins or cabin furnishings. We offer a variety of Nantahala cabin rentals, all on or overlooking this pristine, mountain lake in Western North Carolina. Come and enjoy everything this quiet side of the mountains has to offer. Please provide the following iinformation. We'll check our availability for your desired dates and get back to you right away. Or call 828-321-5975 during business hours. Note: this is only an inquiry, not a reservation. All bookings must be confirmed with a credit card. this question, "How many days in a week?"